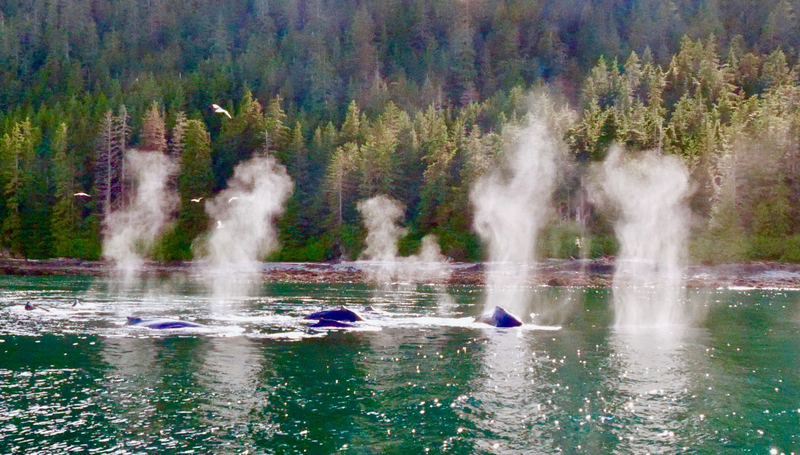 Following reports of whales bubble-net feeding right off the dock in Hoonah, we abandon our leisurely itinerary and head directly to that town. Not surprisingly, the whales are nowhere to be seen but we spend two nights and a day hoping they might return. It is a pleasant place settled in 1754 by Native Americans driven from their homes by encroaching glaciers located in what is now Glacier Bay. This disruption was likely a symptom of the Little Ice Age exacerbated by two back-to-back severe winters - themselves possibly the result of volcanic eruptions in Iceland and the Philippines. 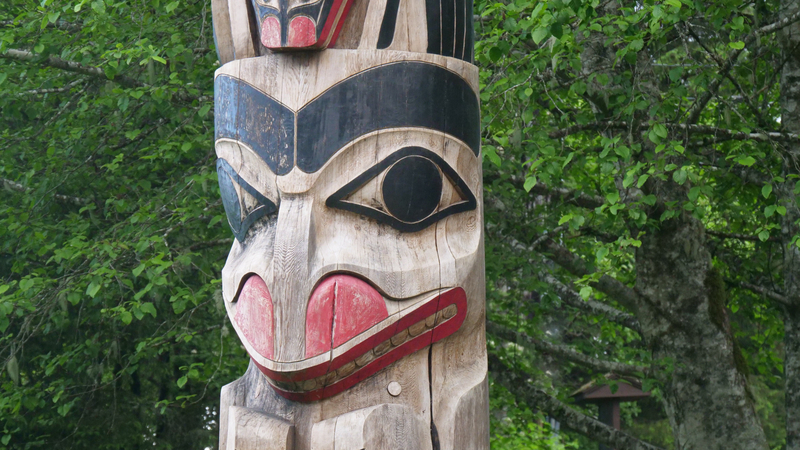 Hoonah is home to the largest Tlingit community in Alaska. 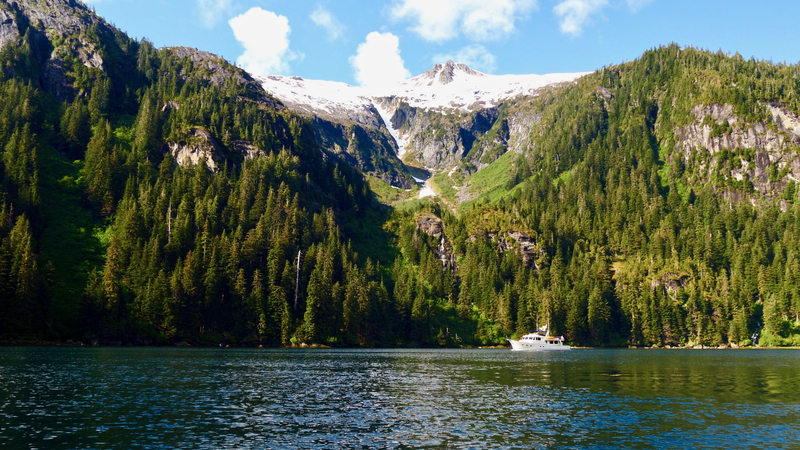 Located 40 miles west of Juneau it is accessible by plane or boat. The Alaska state ferry started calling here in 2010 when the ferry terminal was built, linking the town to the State highway system. The closing of the cannery in 1953 was a major blow but things began to improve with the arrival of the first cruise ship in 2004. Unlike most places, the terminal is located remotely so the leviathan ships do not dominate the town. The passenger levy provides much needed funds. 1/3rd power of the town’s power is generated by hydro. We are underway at 0853 to explore Port Frederick on which Hoonah is situated. We wiggle our way right to the extreme top of the inlet where the history atlas shows a one-time portage across to Tenakee Inlet. 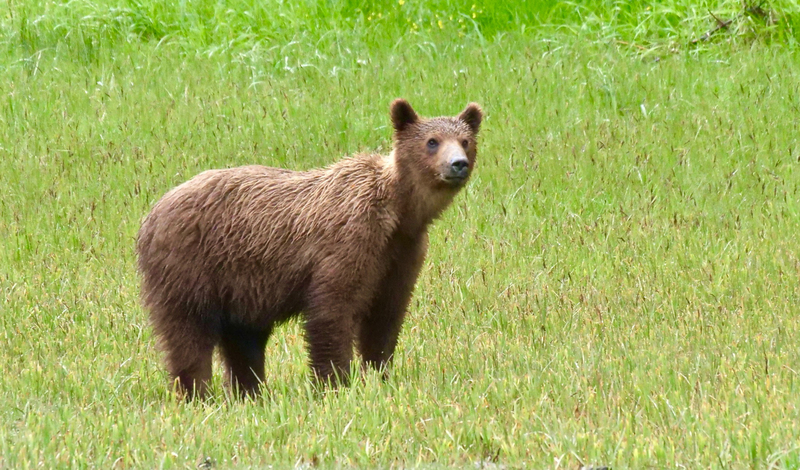 We see a mother brown bear with two cubs but she hot-foots it into the bushes as soon as she spots us. She has obviously had bad experiences with our species. It is always depressing to see this. We retrace our route and return to Chatham Strait. Just south of Point Augusta we spot a number of whales blowing in the distance. We head their way and it becomes obvious they are group feeding but minus the bubbles. They all sound simultaneously and we wait impatiently for twenty minutes for them to re-appear. When they eventually surface, they are some distance north of us. We reverse course and follow them for several of their dive sessions. It is thrilling to see them blow in unison preparatory to diving in unison before resurfacing together with their huge mouths agape. We continue on to Pavlof where we anchor at 1827. 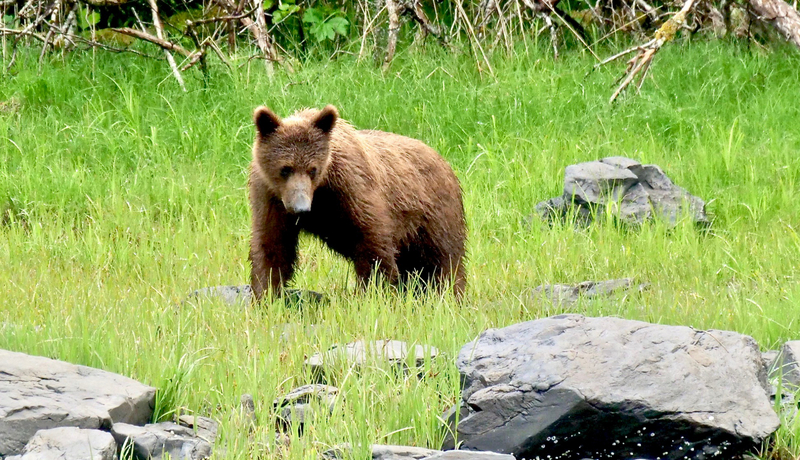 We see one smallish bear peacefully feeding on shore before being chased away by a much larger animal who returned to browse on what must be a choice feeding spot. It rains during the night but we awake to a lovely morning. 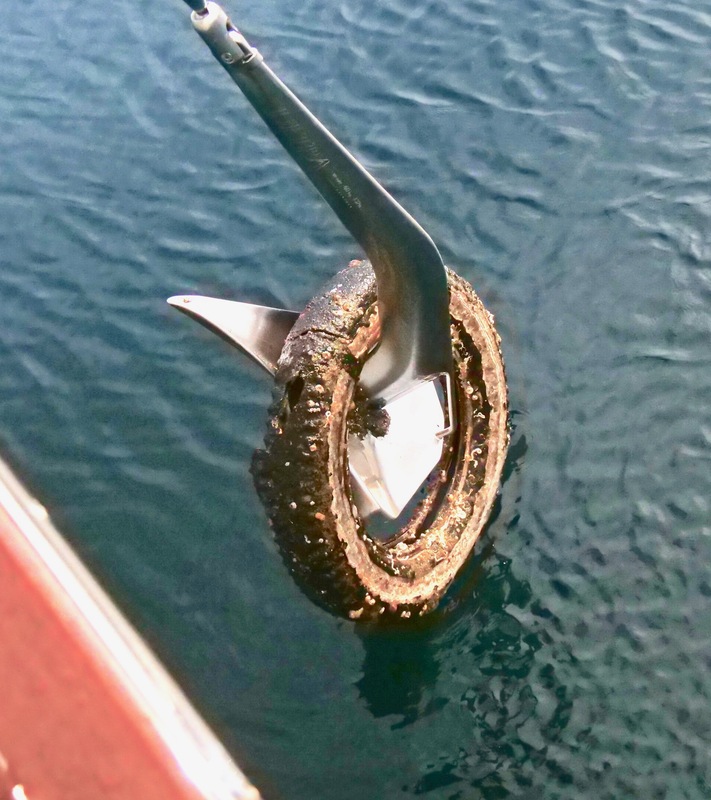 When raising the anchor we find a discarded tyre, hooked over the flukes. 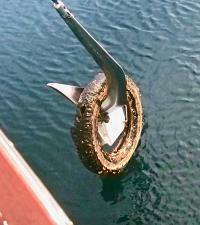 The anchor would never have gripped had we picked this up when anchoring. We continue south down Chatham Strait. We go up the Northern arm of Takatz Bay to check it out and, finding it to be exceptionally beautiful, anchor there at 1410. We launch the large tender and explore the rugged shoreline with is many waterfalls fed by snow melt from the surrounding peaks. We awake to a stunning morning with the surrounding landscape reflected in mirror calm waters. A lone sailboat gives scale to the immensity of our surroundings. When we get underway at 0825, I take the tender to shoot video of Venture underway. We arrive at Appleton Cove at 1310 where, in total contrast to the morning, it is raining with a strong wind.. Doc spots five bears on the grassy flats at the head of the bay. These include a mother with three cubs plus one lone bear. They are a long way off with water too shallow for even a tender between ourselves and them and the tide is still dropping - always a serious consideration! Grey and quite cold with spotty rain. This morning we see six bears in the far distance; a group of deer meander along the beach while a flock of Canada geese take off from the shore and pass overhead in vee formation. Their evocative, plaintive cries floating on the chilly wind. Our route now takes us through the winding channel separating Baranof and Chichagof Islands- aptly named Peril Strait because of its swirling currents. This channel provides a vital link to the city of Sitka - once the capital of Alaska. Situated on the exposed western shore of Baranof Island, Sitka would be even more isolated if not for the inland link provided by Peril Strait. We poke our bows into Poison Bay where over 100 of Baranof’s Aleut hunters were poisoned by eating shell fish during a rest stop. We pass along Deadman’s Reach where an agonizing death meets them within two hours. The trickiest parts of the Strait are through the swirling currents of Sergius and Kakul Narrows where close attention must be paid to accurate navigation. 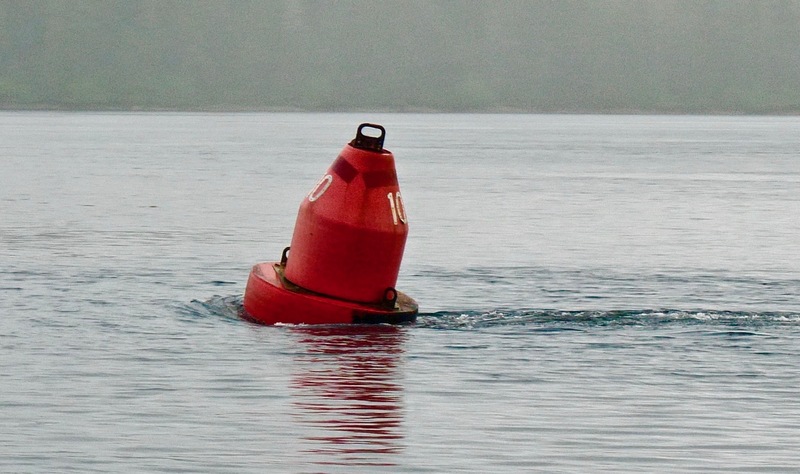 A stationary marker buoy leaves a strong wake created by the powerful current. At the western end of the Strait, Venture rises and falls to the swells of the Pacific Ocean. We anchor in Kalinin Bay at 1216. We see two yearling bears grazing on sedge grass close to the beach. Doc and myself take the tender to shoot video and photos. Very grey misty morning with light rain. We have only a short distance to go today so I cook bacon and eggs for breakfast. We are underway at 1010 moving down Neva Strait and through Krestof Sound. Many fishing boats are out with their outriggers spread wide, fishing for Spring salmon. 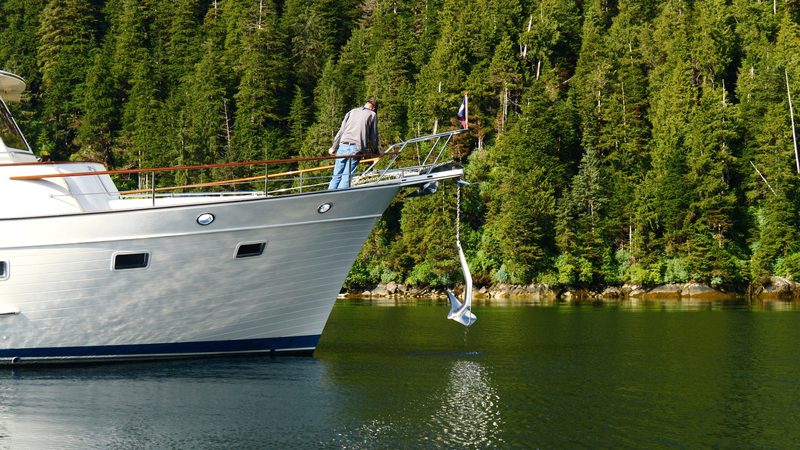 We anchor in un-named bay on Magoun Islands at 1222 and relax for the remainder of the day. It is a beautiful sunny morning for the short hop to Sitka. A small amount of snow clings to the slopes of Mount Edgecumbe. We arrive in Eliason Harbor at 1023 and are allocated a slip much closer to the shore ramp than previously. We are here for five days. 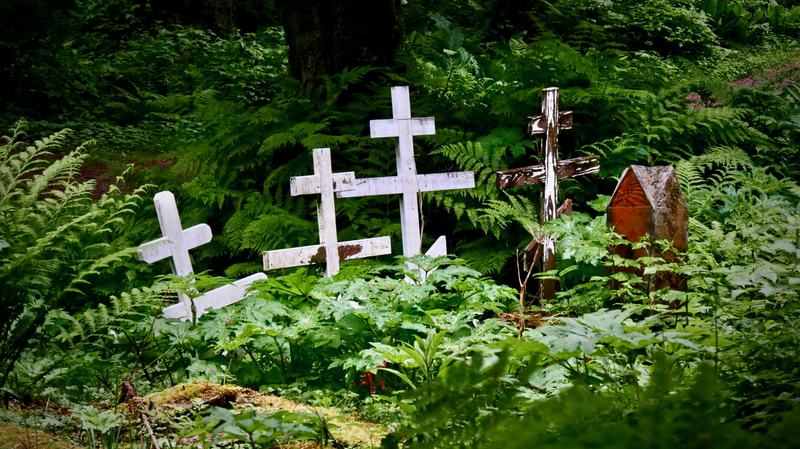 I visit the old Russian cemetery to take photos. It starts to rain while I am at the cemetery. I guess that goes with the territory as much of the cemetery is overgrown with many graves desecrated with angel’s head lopped off and gravestones and crosses toppled. 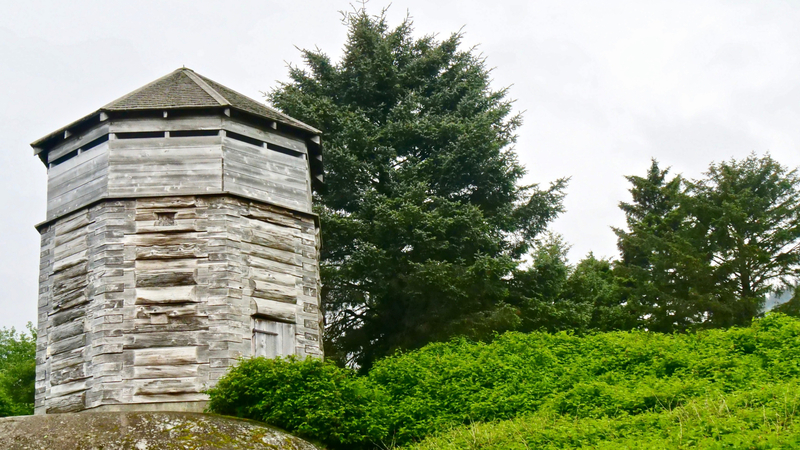 I walk back and on the way come across an old Russian watch tower. The annual Sitka music festival is underway and we visit a the Mean Queen cafe where the Trio Jinx from Baltimore is performing. As they said it is the first time they are giving a concert in a bar and it is very well attended with an enthusiastic audience. 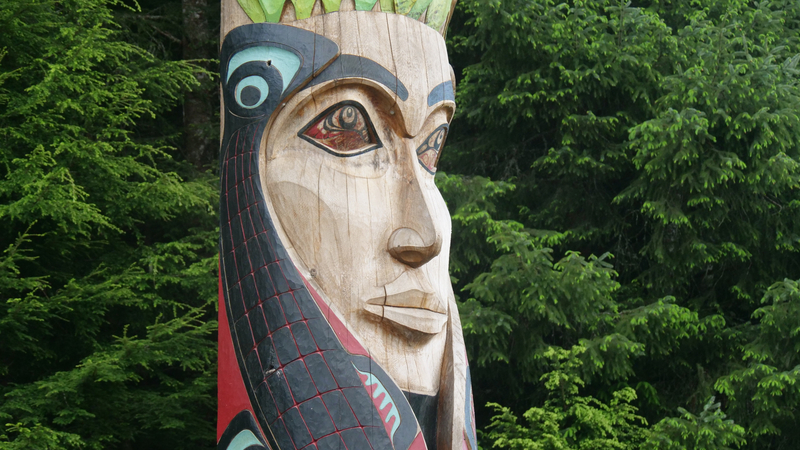 We pay a brief visit to the Sitka National Historic Park which has a fine collection of modern totems. Other places of interest are the Raptor Center whose goal is to rehabilitate injured birds and release them back into the wild. The Fortress of the Bear has similar aims for injured or orphaned bears. 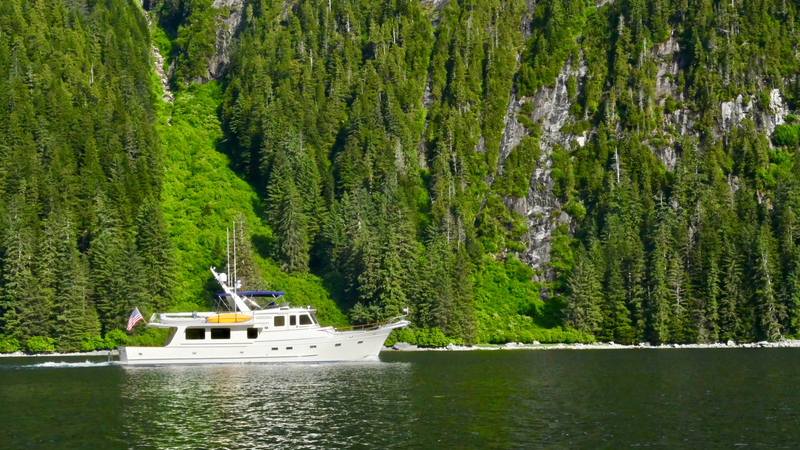 Click below to jump to the other parts of the Venturing Through Southeast Alaska.